Gena Hamshaw of the blog Choosing Raw eats a mostly raw, vegan diet without losing time, money, or her sanity. Let her show you how to make "rabbit food" taste delicious and satisfying every other Thursday on Food52. Today: A quick look at vegan history -- for Gena personally, and for the movement as a whole. 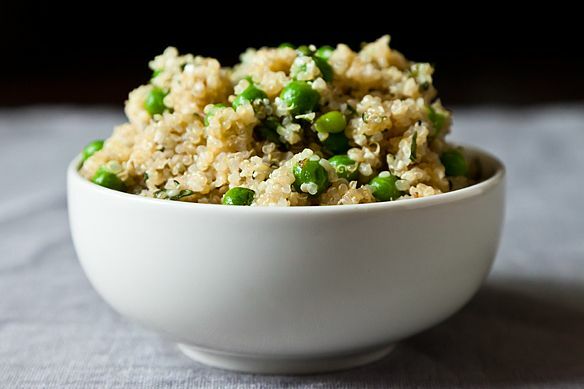 Plus, two vegan superstars -- quinoa and hemp seeds -- make an appearance in lemony quinoa with hemp seeds, peas, and basil. I remember the first time I heard the term "vegan." I was in college, and in spite of the fact that I hadn't eaten red meat regularly since childhood and ate very little poultry or fish, I didn't exactly classify myself as a vegetarian. When a vegetarian friend told me she was thinking of "going vegan," and I asked what she meant, she responded by telling me that vegans not only avoid all meat, poultry, and fish, but also avoid all animal products -- eggs, dairy, chicken stock, and even honey. "Now that," I said, "is just crazy." Oh, how the times have changed. I've been eating a vegan diet for six years now, though I flirted with the lifestyle for at least a year before that. In those six years, I've taught myself how to cook, fallen in love with various global cuisines, gotten to know well over a dozen vegetables I'd never even heard of before I became vegan, and become generally enthusiastic about the food on my plate. That's not at all what people expect to hear about a diet that excludes a great many of the foods that we're all accustomed to. I grew up in a Greek family. Cast aside what you've heard about the "Mediterranean Diet": the two major food groups in my Greek home were lamb and cheese. Though I stopped eating lamb pretty early on, I spent all of my pre-vegan years eating plenty of rich Greek food. And, like most people who are just learning about veganism, I once uttered the words, "I could never live without cheese." What's amazing to me now is that I so rarely think about the foods I don't eat anymore; if anything, my diet seems so much more abundant than it ever did before. There's a learning curve involved, of course, but if you're serious about experimenting with a vegan diet -- even just a little -- I promise you that new vistas of vegetable, legume, and grain dishes await you. And I can assure you that, whether your vegan cooking experiments end up becoming part of a lifestyle change, or they simply inspire you to try a few vegan dinners each month, you'll be really impressed with the beauty and healthfulness of vegan cuisine. So what is veganism, exactly? How does it work? In spite of the fact that most of us kind of understand what veganism is, most of us (even some of us vegans!) get a little confused about the details. So, let's dive into the basics. The phrase "vegan" was coined in 1944, when a British pacifist named Donald Watson started to draw connections between the meat and dairy industries. Realizing that calves born on dairy farms were often sold to beef farmers, and that egg-laying hens were often sold to poultry farms after their prime, he came to the conclusion that a truly vegetarian diet was one that excluded all animal foods -- not just meat, poultry, or fish, which vegetarians over the centuries had chosen to avoid already. Ultimately, Watson's definition of veganism came to include animal commodities, like leather and fur, as well as animal foods. The working definition of veganism remains largely the same today: most vegans avoid all animal foods and don't purchase leather, wool, or fur. Most vegans also check cosmetic labels for animal products or testing, too, and are mindful of sneaky animal by-products, like gelatin, and production methods, like the use of isinglass in wine making (vegan wine is a topic for another post!). Honey tends to be a matter of discretion; some vegans don't consume it out of a sense of philosophical consistency and because conventional honey has been shown to be somewhat deleterious to bee populations; others support local, small honey operations. An interesting development, especially in recent years, is that a lot of people have become interested in veganism for health reasons. (See: Bill Clinton.) These folks often choose to identify as "plant-based eaters," rather than vegans, to distinguish between health motives and motives that are tied to animal wellfare. I began my vegan journey for health reasons and now identify with animal rights, too; your own interest in veganism may be a combination of a lot of things, and it might change over time! When you first start to explore vegan cooking, it's inevitable that you'll feel a little overwhelmed. The important thing is to remember that a lot of the foods we already know and love -- oatmeal, rice and beans, curry, salad, smoothies, risotto -- already are, or can easily be made, vegan. The other important thing to be aware of is that there are a ton of vegan substitutes that are now readily available at grocery stores. No, I don't mean "fake meat," which some vegans love, but doesn't always appeal to foodies who are used to the "real thing." I mean minimally processed and high quality substitutes like organic almond or soy milk. While there's a good chance that your vegetable, grain, nut/seed, and legume creations will be totally self-sufficient, just be aware of the fact that there are a couple of handy products that can fill in for what you're used to -- if you need them. The other thing to remember is that it's important to start small. Nobody goes vegan overnight (well, OK, maybe some folks do, but it's not the norm). Whether you're hoping to get a little healthier, add more vegetables to your diet, help to reduce your impact on the environment, or do something for animals, you can explore veganism one plate at a time. It isn't an instant commitment, and it doesn't have to feel scary. If it's helpful, think of it as a culinary experiment; treat it as you would an effort to master the art of pasta making, or explore Indian food. All you're doing is coming up with a few great dinners that consist of vegetables, beans, grains, nuts, seeds, and fruits -- and you've got a big pantry full of vegetable oils, soy sauce, herbs, and spices to help you! That's hemp on the left and quinoa on the right. The following dish is a great example of a vegan "starter meal." 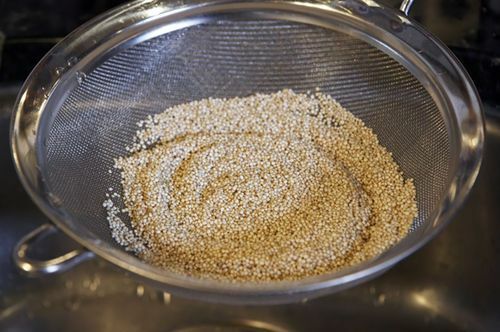 For one thing, it'll help you to master one of the most trendy vegan grains: quinoa (pronounced "keen-wa"). 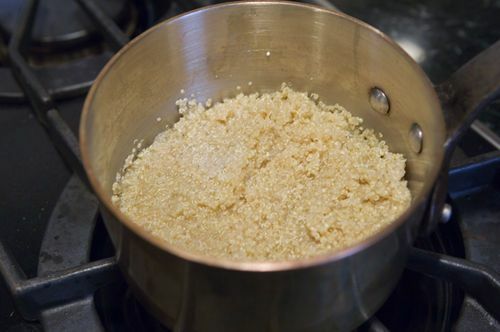 Quinoa is actually a "pseudograin" (more seed than grain), and it's popular not only because it's got a wonderful, nutty flavor, but also because it's a "complete" protein. As you probably know, "where do you get your protein?" is the number one question that new vegans are asked. We'll talk vegan protein very soon, but for now, suffice it to say that there are some foods that naturally contain all of the "essential" amino acids we need to thrive. 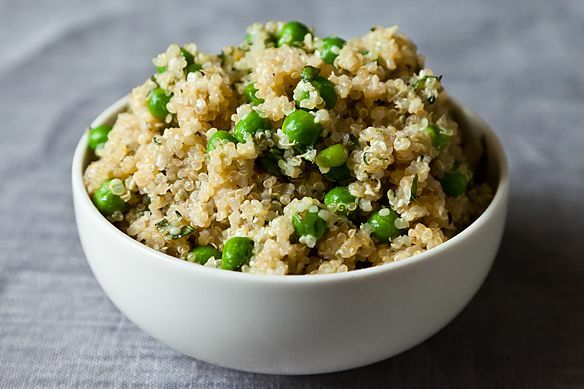 By pairing various legumes, grains, and plants together, vegans can absolutely get all of these amino acids, but it's always nice when a vegan food -- like quinoa or hemp seeds -- provide all of those amino acids for us. Along with good flavor (of course). 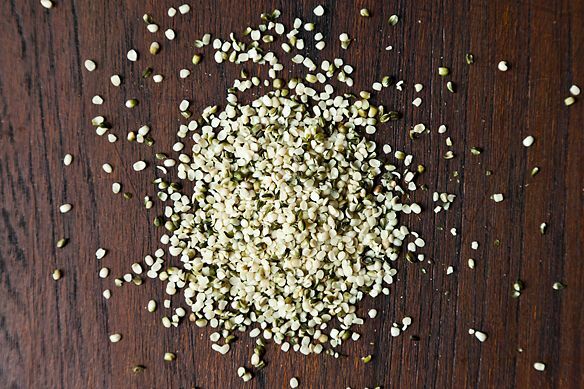 This dish shows off hemp seeds -- also a source of complete protein -- alongside the quinoa. Both of these ingredients are sort of famous for being "hippie foods," but as you'll see, they're both perfectly accessible and delicious, especially when paired with fresh herbs and a squeeze of lemon. Feel free to substitute the basil for dill, oregano, or another herb of choice; no matter what, they result will be a tasty, satisfying, and simple meatless meal! Made this last night...it is simple, yet tasty; healthy, yet filling. I'll be making this again soon! I love this overview! I'm with you - I don't feel deprived at all. In fact, I eat a far wider variety of foods since going vegan! Love this recipe - complete meals in one bowl make me happy!